I don’t know about you guys, but my local grocery store has been getting in some gorgeous berries the past couple weeks. It’s my idea of California Dreamin’ in these bleak winter months. What a wonderful state – right? To produce this kind of produce all year long? Seems like the cold has finally REALLY set in here, and I’m ready to pack my bags! So, yeah – these brownies. They’re nothing short of amazing. I changed the original recipe up a bit by adding whole raspberries to the brownie batter, and also by adding some pureed berries in place of the raspberry jam in the topping. The result was a moist chocolate brownie, studded with tart raspberries – and topped with a not-to-sweet raspberry chocolate frosting. That’s important, because I was a bit concerned they’d be too sweet – but it really was just right. These would be perfect for Valentine’s Day, but honestly I don’t think you’ll want to wait another month and a half to make these. If the berries in your store are looking good, pick some up and make them this weekend. You won’t regret it! Preheat the oven to 350 degrees. Grease an 8×8-inch baking pan and set aside. In a heavy saucepan, melt the butter and chocolate chips over low heat. Cool slightly. In a small bowl combine the flour and baking powder, whisk to combine. Set aside. In stand mixer fitted with a paddle attachment, beat the eggs and brown sugar until combined. Add vanilla extract. Dissolve the coffee crystals in hot water and add to chocolate mixture. With mixer on low, slowly add the chocolate to the eggs and sugar. With mixer still on low, add the flour to the bowl and until just combined. Using a rubber spatula, gently fold in the raspberries. Pour into prepared baking dish and place in oven to bake for 30-35 minutes. Until toothpick inserted into center comes out clean. Cool completely before frosting. For the filling, melt the chocolate chips and let cool slightly. Puree raspberries using a food processor until smooth, them push through a fine mesh strainer to remove the seeds. Set pureed berries aside. In a mixing bowl, beat the cream cheese until fluffy, with mixer on low add the powdered sugar, melted chocolate, and pureed raspberries. Mix until well combined. Spread the filling evenly over the cooled brownies. Refrigerate for a couple hours before slicing and serving. For the drizzle, melt the chocolate chips and shortening – stirring well to combine. Drizzle glaze evenly over cooled brownies. Garnish with fresh raspberries. omg – raspberry and chocolate are fabulous together. I’m starring AND pinning this. MMM….chocolate and raspberry is my hands down favorite combo. Pinning this recipe to try for Valentine’s Day! Gorgeous brownies, I love that these are full of raspberries! These remind me of a warm chocolate raspberry pudding cake on my blog that I haven’t made in a long time. Can’t wait to try these! Berries are great reminders that summer will return. 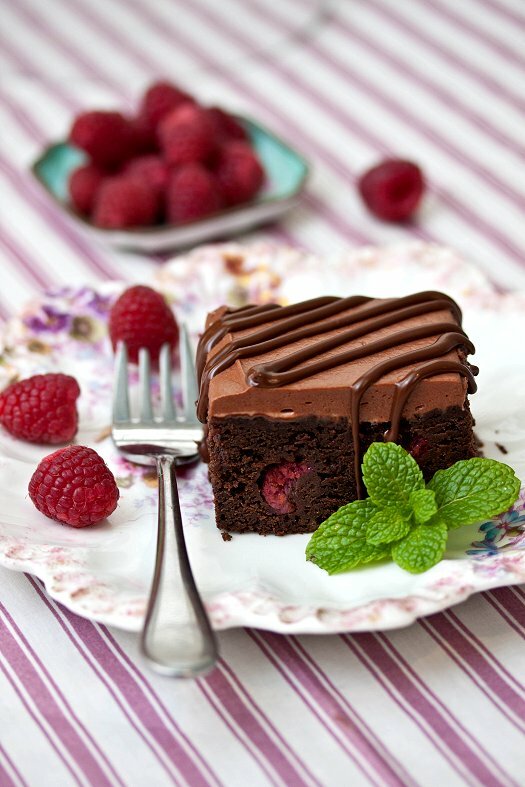 I’ve seen raspberries in many a chocolate cake, but into a chocolate brownie seems extra decadent. YUM! These look amazing!! Chocolate and raspberries go wonderfully together, can’t wait to try this. Question how do you get your frosting to come out so light. When I made it, the frosting came out as dark as the brownie. Do you not put the full 1 cup of melted chocolate chips into the cream cheese? Also what semi-sweet chocolate chip brand do you use? Thanks! I believe I used Ghirardelli, and yes I added one full cup. If you’re that worried about it, you could add some additional cream cheese or powdered sugar to make it lighter in color. Or, add a little bit more cream cheese. Absolutely stunning! Easy to follow instructions, simple ingredients. A tiny square of this brownie is like an entire meal! I certainly did not regret making this recipe! Thanks for sharing!